The SpaceX Falcon 9 that triumphantly accomplished history’s first upright landing of the spent first stage of a rocket on a barge at sea – after launching a critical cargo payload to orbit for NASA – sailed back into port at Cape Canaveral overnight in the wee hours of this morning, April 12, standing tall. 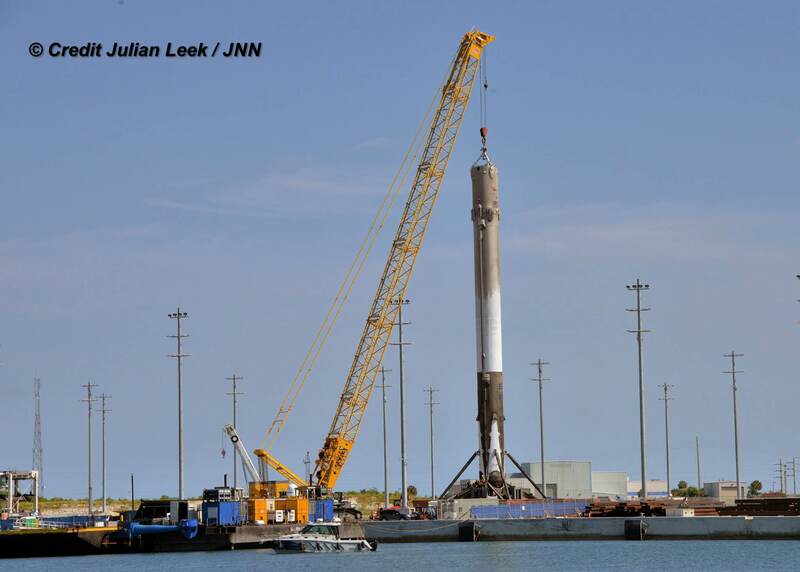 The recovered 15 story tall Falcon 9 booster arrived back into Port Canaveral, Florida at about 130 a.m. early today, towed atop the ocean going platform that SpaceX dubs an ‘Autonomous Spaceport Drone Ship’ or ASDS. The ship is named “Of Course I Still Love You” after a starship from a novel written by Iain M. Banks. The landing platform measures only about 170 ft × 300 ft (52 m × 91 m). A small crowd of excited onlookers and space photographers savored and cheered the incredible moment that is surely changing the face and future of space exploration and travel. The two stage SpaceX Falcon 9 rocket boasting over 1.5 million pounds of thrust originally launched on Friday, April 8 at 4:43 p.m. EDT from Space Launch Complex 40 at Cape Canaveral Air Force Station in Florida. The primary goal of the Falcon 9 launch was carrying the SpaceX Dragon CRS-8 cargo freighter to low Earth orbit on a commercial resupply delivery mission for NASA to the International Space Station (ISS). Before the launch, SpaceX managers rated the chances of a successful landing recovery rather high. Three previous attempts by SpaceX to land on a barge at sea were partially successful, as the stage made a pinpoint flyback to the tiny ship but either hit too hard or tipped over in the final moments when a landing leg failed to fully deploy or lock in place. “We were very optimistic of the chances of a successful landing on this mission,” Hans Koenigsmann told Universe Today in an exclusive post landing interview at the NorthEast Astronomy and Space Forum (NEAF) held in Suffern, NY. Coincidentally, today marks two major anniversaries in the history of space flight; the 55th anniversary of the launch of Russia’s Yuri Gagarin, the first man in space on Vostok-1 on April 12, 1961; and the 35th anniversary of the launch of shuttle Columbia on America’s first space shuttle mission (STS-1) on April 12, 1981 with John Young and Bob Crippen. The vision of SpaceX’s billionaire founder and CEO Elon Musk is to dramatically slash the cost of access to space by recovering the firms rockets and recycling them for reuse – so that launching rockets will one day be nearly as routine and cost effective as flying on an airplane. The stage will now be painstakingly inspected, tested and refurbished. The essential next step after recovery is recycling. Musk said he hopes to re-launch the booster this year. At liftoff, Dragon was loaded with over 3.5 tons of research experiments and essential supplies for the six man crew living aboard the orbiting science complex. The Dragon CRS-8 cargo ship successfully arrived at the station on Sunday, April 10 and was joined to the million pound station at the Earth-facing port of the Harmony module. The secondary objective was to try and land the Falcon 9 first stage on the ASDS done ship located some 200 miles off shore in the Atlantic Ocean. The action-packed and propulsive landing took place some 10 minutes after liftoff. In the final moments of the descent to the drone ship, one of the first stage Merlin 1D engines was reignited to slow the boosters descent speed as the quartet of side-mounted landing legs at the boosters base were unfurled, deployed and locked into place. The entire launch and landing sequence was webcast live on NASA TV and by SpaceX. The recovered booster atop the “Of Course I Still Love You” barge was towed back to port by the Elsbeth III tug. “Home sweet home”, said my friend and veteran space photographer Julian Leek, who witnessed the boosters arrival back in port overnight. After daylight dawned, a crane lifted the recovered booster into a storage cradle where it will remain upright for a few days. Then it will be lowered and placed horizontally for transport a few miles north to a SpaceX processing hanger back at pad 39A at the Kennedy Space Center. The booster will be cleaned and defueled, SpaceX spokesman John Taylor told the media. SpaceX engineers will conduct a series of 12 test firings to ensure all is well operationally and that the booster can be re-launched. Like Frazer said in this week’s hangout, it was amazing to see the Falcon come in SO FAST, then stop so suddenly and with such accuracy! SUUWEET! “The booster will be cleaned and defueled…” Of course the liquid oxygen can simply be vented, but the RP1 is a different story? Does the Falcon also use Hydrazine to power mechanical actuators – grid fins, landing leg clamps etc. ?